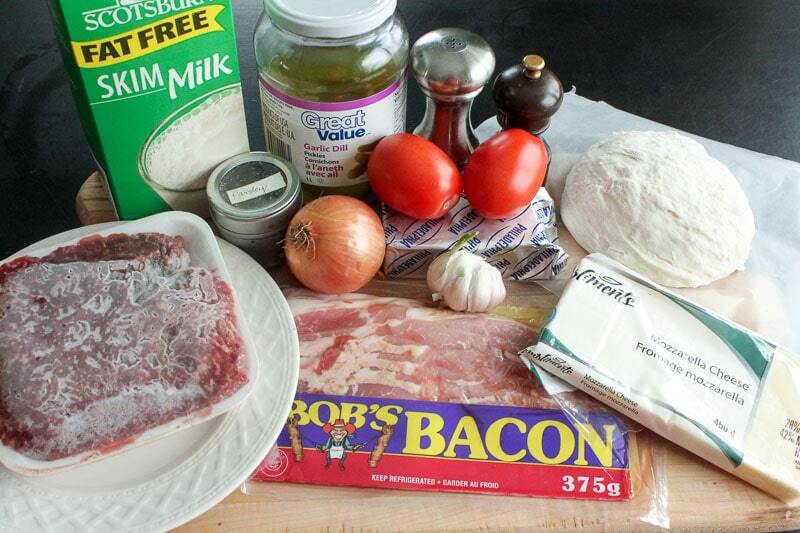 This Homemade Bacon Cheeseburger Pizza combines two foods most people LOVE – pizza and cheeseburgers. Seasoned ground beef, delicious sauce and tangy pickles on a thick or thin crust. Make it for dinner tonight, for parties or potlucks, or to stock in your freezer. It’s a crowd-pleaser! Everyone loves it! Isn’t pizza pretty much the most universally loved food? Anytime we’re stuck for what to make for dinner, especially if it’s on a weekend and we feel like having a treat, we mention pizza. We love it, the kids love it, the leftovers ALWAYS get eaten (has anyone ever thrown out leftover pizza? I doubt it), and it freezes super well. 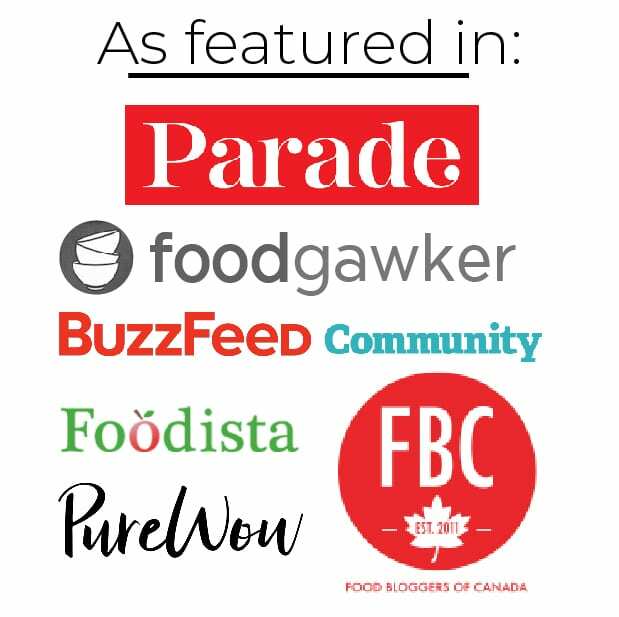 Pizza always comes to the rescue when I need to make a tasty appetizer or dinner to bring to a party or potluck, we’re getting together with friends, or I just want to make some quick favourites to stock our freezer. Lately I’ve been having fun experimenting with mashups of favourite foods. For example, we LOVE bacon cheeseburgers. And we LOVE pizza. 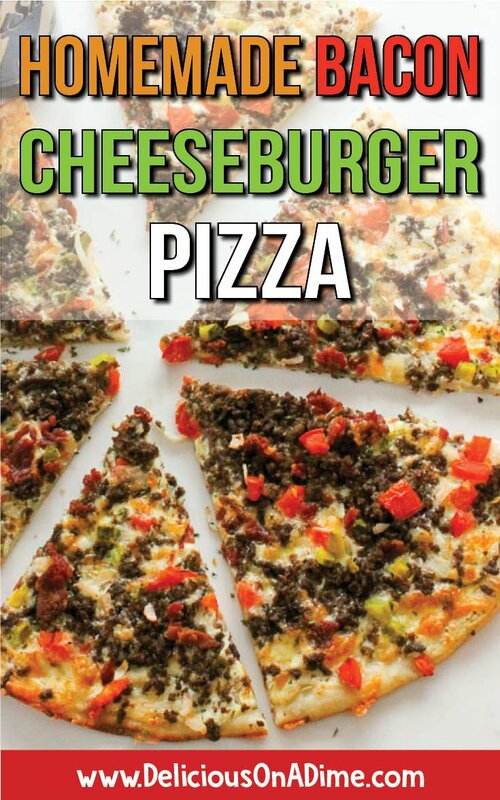 So, today, I bring you BACON CHEESEBURGER PIZZA. Yum. 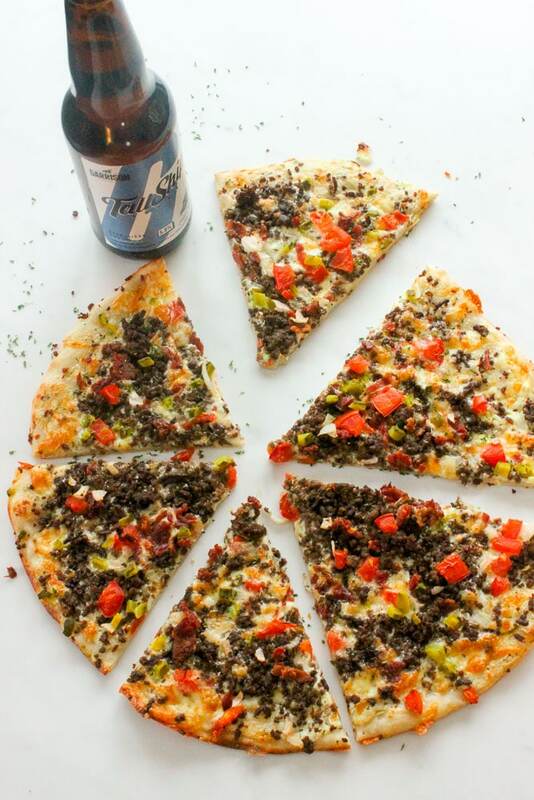 Well, in our cheeseburger pizza I use toppings we love on our actual cheesebugers: seasoned ground beef, cheese, onion, tomato, and dill pickles. Plus a delicious garlicky, creamy sauce. Everything is pretty cheap, and while I used 1 lb of ground beef you could definitely use less. 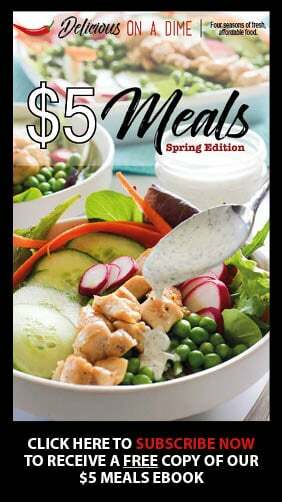 Or do something else with the leftovers. 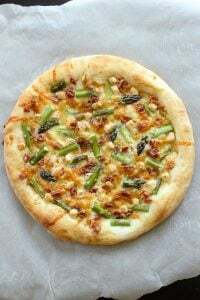 I love this pizza. 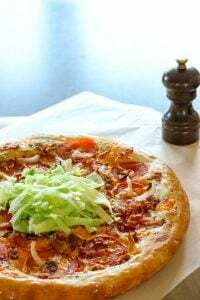 The sauce is really delicious, I think ground beef is always super tasty on pizza, and I really love the tangy pickles on top. Just like a cheeseburger! 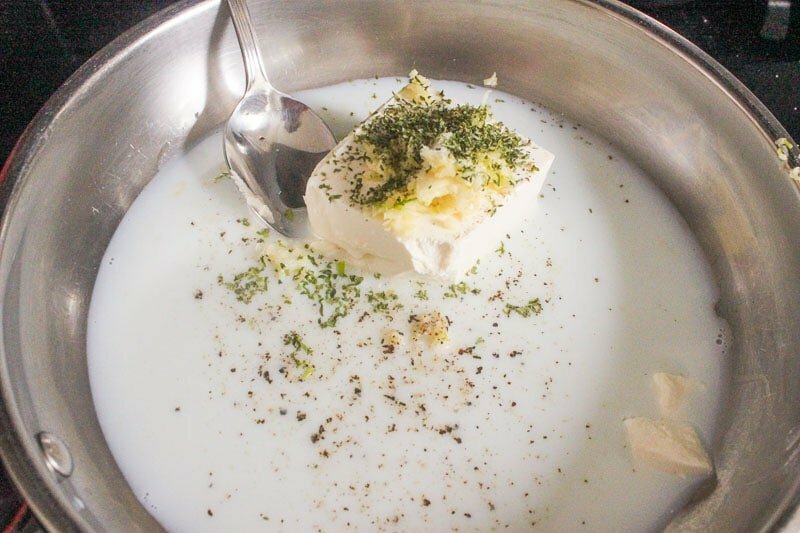 In a saucepan, combine 4 oz (half a block) of cream cheese, 1/2 cup of milk, 3 cloves of minced garlic, 1/2 teaspoon of dried parsley, 1/4 teaspoon of salt and a pinch of pepper. 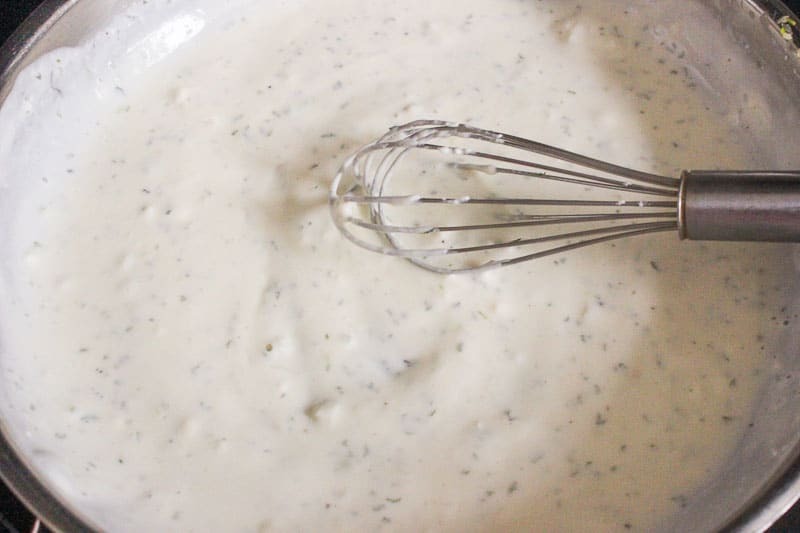 Whisk over low heat until it melts into a creamy, delicious sauce. Set aside. Meanwhile (at the same time, if you’re a multi-tasker), fry 1 pound of ground beef over medium heat. Add 1/4 teaspoon of salt and 1/8 teaspoon of pepper to the mix. Drain off extra fat if necessary. Set aside once it’s cooked. 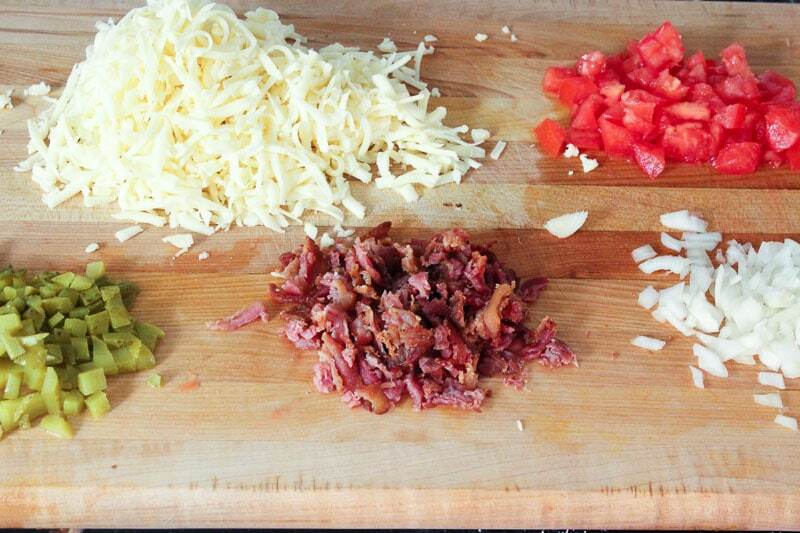 Prep your other ingredients. I like to cook our bacon in the microwave because it’s very hands-off. 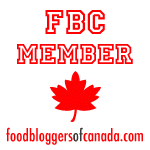 I used 1/2 package (it was a 375 gram package – not a full pound). Dice 1/2 an onion, 1-2 tomatoes (see notes above), 2 large dill pickles (or more or less, to taste) and grate 225 grams (1/2 a large package) of mozzarella cheese. 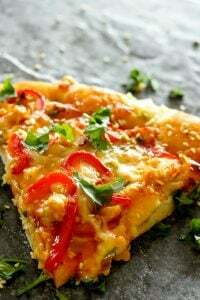 We have two awesome and easy dough recipes on our blog: Thin Crust Pizza Dough (No rise!) and Simple Pizza Dough (which is a thick, fluffy crust). 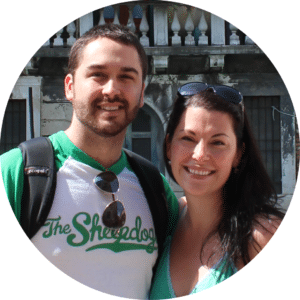 They each make 2 – 12 inch crusts or 1 – sheet pan crust. If you’d rather buy dough you should get enough for 2 – 12 inch pizzas. Spread dough into oiled pans. Sprinkle with cheese, cooked ground beef, cooked bacon, tomato, onion and dill pickles. Bake in preheated oven. If you’re making two pizzas, center your racks in the oven. Bake for 8 minutes, rotate pizzas from top to bottom and bake for 8 more minutes. Check to make sure the underneath of the dough is lightly browned. If you’re using one large cookie sheet, bake for 14-16 minutes. Check the underneath of the dough to make sure it’s lightly browned. 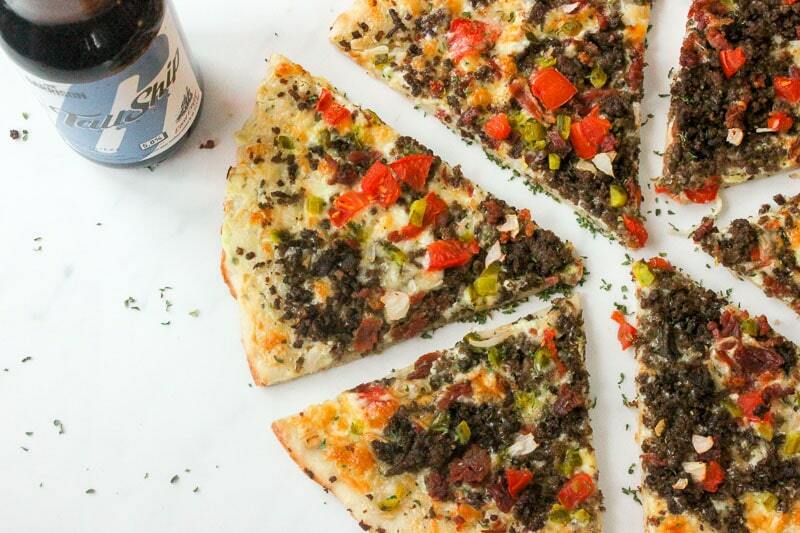 This Homemade Bacon Cheeseburger Pizza combines two foods most people LOVE - pizza and cheeseburgers. 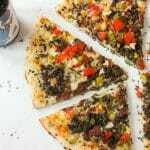 Seasoned ground beef, delicious sauce and tangy pickles on a thick or thin crust. Make it for dinner tonight, for parties or potlucks, or to stock in your freezer. It's a crowd-pleaser! Everyone loves it! Preheat oven to 450 degrees F. Arrange racks as close to the center of the oven as possible. Combine all the sauce ingredients in a pan or pot and heat over medium heat. Warm until cream cheese melts and whisk together to combine well. Set aside. 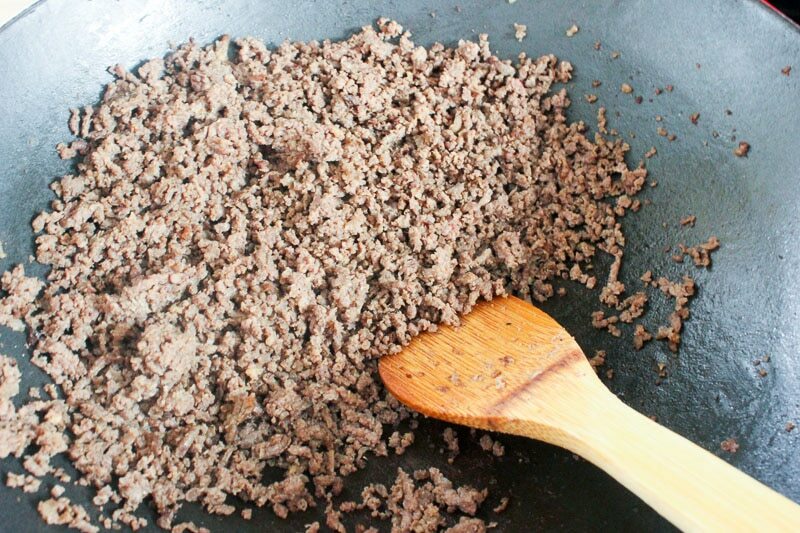 Meanwhile, cook ground beef, salt and pepper in a large pan over medium-high heat until completely cooked. Set aside. 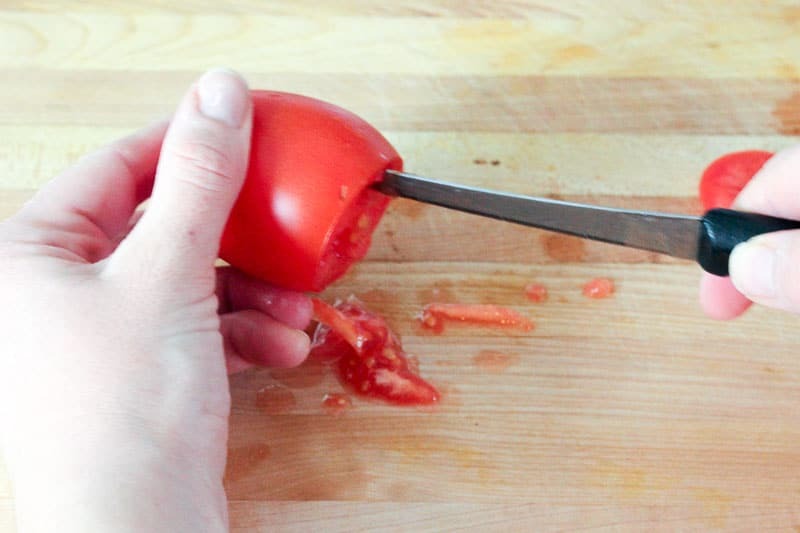 Cut top off tomatoes and use a sharp knife to scoop out seeds and pulp from the inside, squeezing the juice out (discard). Chop tomatoes into small pieces. Shred cheese, crumble cooked bacon, mince onion and dice dill pickle into small pieces. Oil 2 pizza pans or 1 sheet pan. Stretch dough over pans and press it into edges. 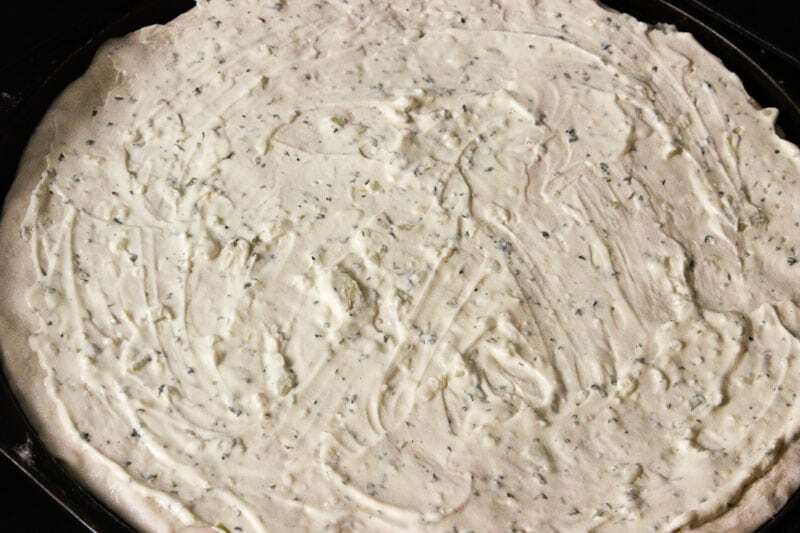 If you use one of our dough recipes it will make 2 round pizza pans (12 inch) or one sheet pan. Top with sauce. 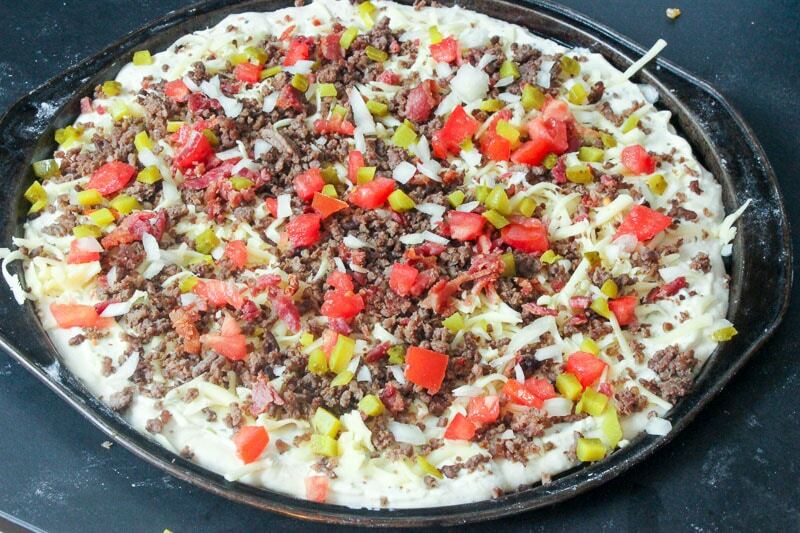 Sprinkle with cheese and top with remaining pizza toppings (ground beef, tomato, onion, dill pickles). Bake in preheated oven. If baking two pizzas, bake for 8 minutes, rotate between racks and bake 8 more minutes. Check bottom to make sure it's lightly browned (baking time will vary slightly depending on how thick your dough is). For one pizza start checking after 14 minutes. 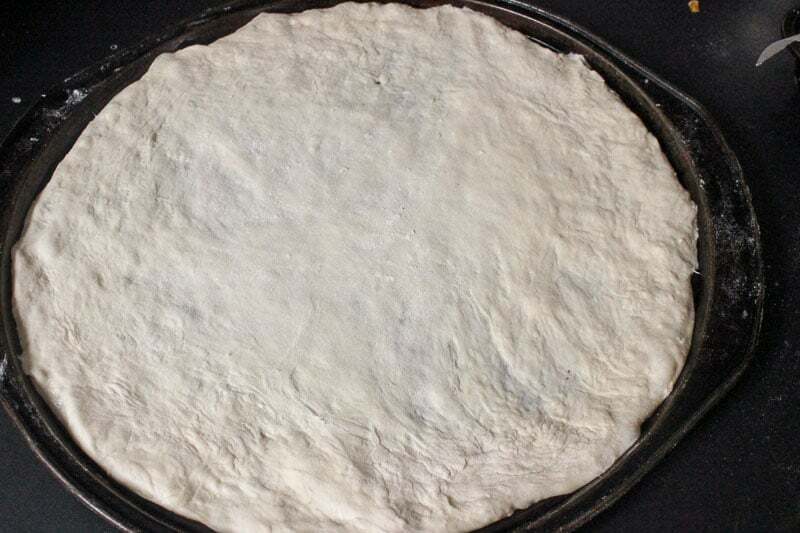 Thin Crust Pizza Dough No Rise!